Our best close-up yet of Catelyn Stark, the Lady of Winterfell. We can see a hint of her garment beneath the heavy fur collar of her cloak, and that it features a sort of rouching reminiscent of some of the items we’ve seen some of the other Stark children wear. 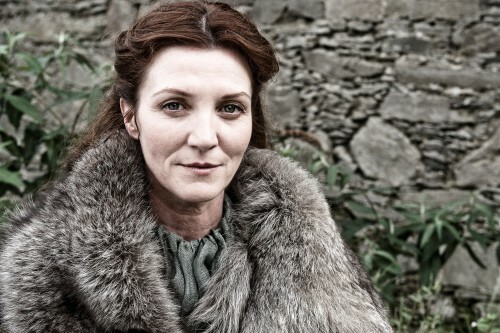 With her auburn hair, she conveys the Tully look of her family, and Michelle Fairley seems to convey something of Catelyn’s calm persona. Fairley’s performance won early praise from critics, who remarked variously that her performance was complex, impressive, and “earthy”. It’s interesting that a critic who has seen the original pilot, which featured Jennifer Ehle in the role, found Fairley’s performance to be a less warm interpretation of the character, but he found this suitable as it seemed to fit the Catelyn of the novel better.